Ikm New to this forum. 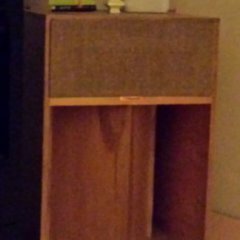 Im looking for the integrated amp for Klipsch RP-250F. Marantz and Nad are rated 70 W in 8ohm while Yamaha is 100w. But heard that Marantz and Nad sound is superior. Any suggestions are very wellcome! It really comes down to personal preference. All three(four) will drive your RP-250F's just fine in a typical room with typical volume levels. I currently own two of the mentioned brands, NAD and Yamaha, and both do a fine job in their current pairings. If you have the speakers already, bring each home to see if you like the pairing. All are in the same class.and might sound slightly different in the combo. I would lean toward the Yamaha and Marantz first but this is purely personal preference. So in your opinion having 80W instead of 100 ( that those speakers theoretically need) is fine? Also, if you had to chose between Nad and Yamaha, which one you would go with? You or your speakers won't notice a difference between 80 and 100 watts, but every receiver or amp will sound a little, sometimes a lot different. Hard to say. Reliability track record, I say Yamaha, though I have never had any NAD gear fail or even hiccup. Sound quality, from my experience, both sound great. Thank you for all the answers. Has anyone had any expierence with CA CXA80? If chosing between CA CXA 80 and Nad c 368 which one would you suggest? Thank you for your recommendations!! Just wanted to throw another option your way. Easily worth the price of entry. One of, if not the best sounding integrated amp I have ever owned. I'm not as fond of the NAD equipment unless it is purchased at a good price. I see way too much refurb'd out there. I guess it also could be that they sell a lot. All are good equipment for their class. This is a very good option if negotiable and you are close. Even though I’m a Marantz fan you could probably toss a coin between it and the NAD.